How Different Our Weapons: Surrender??? our adversary would want to bring against us. And like peace, surrender is not a passive, defensive weapon but one of the most potent offensive weapons in a believer's arsenal. Consider the following thoughts. We are obviously not talking about surrendering to the enemy, but rather to God. Jesus modeled this for us by living the perfectly surrendered life: "the Son can do nothing on his own, but only what he sees his Father doing," and "I can do nothing on my own...I seek to do not my own will but the will of him who sent me." (John 5:19, 30 NRSV). We see from these words and other descriptions of Jesus' life that He lived a life of "absolute surrender" (Andrew Murray's term) to His Father which meant surrender to His Father's will. And no one did more destruction to the enemy than Jesus (see Acts 10:38 and John 3:8, for example), so we can see that surrender is for sure a very powerful offensive weapon against the devil. But how does it work? First, please note that we are talking about surrender to a Person, not to principles, a way of life, circumstances, etc. We are not talking here about begrudging resignation to "what is" nor capitulation to circumstances. Nor are we talking about servile submission to an uncaring Master. We are talking about trusting surrender and dependence-drenched collapse into arms of the One who knows everything and loves completely. 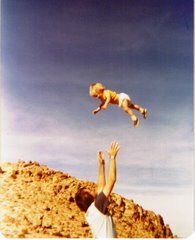 I think the picture of my son Jon up in the air might be a good picture of this, or perhaps the trusting surrender of a wife to her gentle and caring husband as they enter into physical intimacy. Second, the nature of this surrender is not quiet, forced submission to someone who has more power and needs to control things. No, the surrender we see Jesus model was bathed in communication, with both Father and Son listening to one another. Nowhere do we see this stated more clearly that in John 11:42 where Jesus says to His Father, "I knew that you always hear (listen to) me." What a remarkable glimpse this gives us of the mutual surrender that love and trust bring to a relationship! The Father "surrenders" to the Son's request, the Son surrenders to His Father's direction and depends totally upon His Father's power and authority! I think you can see how this fits for us as well. Third, surrender is made in the context of the experienced love of God. In John 5:20, right after saying He can do nothing on His own, Jesus says, "Because (for) the Father loves the Son..." Wow! Jesus knew Father's love so well, and experienced His Father's love so completely and continuously that surrender was His automatic response. Think about this one and how it can unfold in your life, and you will be blown away by the implications, I think! Fourth, surrender results in the exchange of our weakness and ignorance for the limitless power and knowledge of God. Through surrender we relinquish our feeble understanding and strength in the context of a loving, listening relationship, and this results in the flow of limitless power through our surrendered wills. This is, I think, why surrender is such a powerful weapon. Not only do we take refuge within God's embrace (castling within the Father's heart), we also exchange powerless weapons for those of limitless power. Finally (for now), like peace, surrender is both a weapon and a means to the use of other weapons in our arsenal. It is only the surrendered heart that can remain at peace in the storm, the surrendered will that will burst forth with kindness, gratitude and generosity, etc. I could write more, but I think you get the picture. I know I could write more about this. Indeed, Andrew Murray wrote an entire book about surrender, so I have for sure barely scratched the surface here. But my hope is that as you try this weapon out you will experience what millions of believers have experienced down through the ages: the love and power of God released through your increasingly trusting and surrendered life. Try it, you'll like it, and so will those around you. In light of the recent tragic shooting in Aurora, CO and in light of my constant running across people who have been so badly hurt by life (victims of physical and sexual abuse, victims of neglect and poverty, and on and on), I thought about writing some thoughts about God's sovereignty. God doesn't cause evil by "allowing" evil to happen, yet many Christians seem confused by how to reconcile a good, loving and sovereign God with the presence of terrible evil in our current existence. But then I remembered that I did write something about this not too long after my own brush with evil. Yes, I have a few more thoughts to add to what I wrote then, but I will wait until later for that. For now, I just edited the previous article and offer you this link if you want to see what I wrote back then. So for today, I choose to write about one of my favorite (and sometimes forgotten!) weapons: gratitude. But before I write about this remarkably simple and effective weapon, please consider the following. It has occurred to me more than once that my writing about these (truly different) weapons might cause some folks to start "working on their weapons." That would be a travesty and would lead them completely away from how these weapons are formed and work. You can't "do" the weapon of peace or "use" the weapon of simplicity or generosity. Rather the whole point of my highlighting how different our weapons are is to to make it clear that intimacy with God is the source of our "weaponry," and anything that moves us towards self-focus or self-effort--trying harder--is missing the point entirely. Some of you, I am sure, have noticed by now that many of the weapons sound remarkably similar to the fruit of the Spirit :-) That is intentional, of course, because the unique power of these weapons rests in their being "divine" and rooted in the character of God. So none of these weapons are effective if wielded by human effort. Trying to make yourself peaceful, force yourself to be generous, make yourself embrace simplicity, etc., will not release God's peace or love into a situation! I will write more about how these weapons are formed, but for now I suggest that you consider what I wrote in the first article in this series: these weapons are formed and sharpened as we learn to live loved, listening, saturated and surrendered in community with other believers. But now, consider with me the very streamlined and powerful weapon of gratitude (thankfulness). This has to be one of the simplest weapons in our arsenal. It's relatively easy to activate, too, consisting basically of a Holy Spirit-empowered decision to shift one's focus ever so slightly :-) from whining to giving thanks. This weapon popped up for me personally this past week as God quite literally interrupted my whining about all the change in my life to suggest that I would do better to start listing all the good things that have come because of it. I cannot tell you how different the world looked after a few minutes of doing so! I should note here, I think, that giving thanks, having an "attitude of gratitude," doesn't mean discounting our pain or short-circuiting necessary grieving over loss. Rather it is more like choosing to superimpose a larger and greater reality over the pain. This reality has two parts, at least, I think: 1) the immediate fact that even in the darkness some light is present (counting blessings in the midst of the storm or seeing the small flower blooming in the prison yard, etc. ), and 2) the eternal perspective in which God redeems everything (it occurred to me this week that the vast majority of our lives will be lived in eternity, not in this present existence--Big thought!). Timing has something to do with this, too. It's truly unkind to tell someone who has just suffered great loss to "give thanks" and just "praise God"! The human soul needs time to heal, and "choosing to give thanks" at a time when Papa is trying to heal a broken heart, simply holding His child while s/he cries, is counterproductive. But when He begins to whisper the invitation to give thanks, the earlier we choose to respond, the better! There are many scriptures about this, of course. 1 Thessalonians 5:18 particularly comes to mind. I commend to you a study of the words thanks and thanksgiving in your electronic Bible :-) But for now, see if Papa doesn't say something to you as He did to me this week, about picking up the weapon of gratitude. There is, I think, a certain irony in my not being able to find my old copy of Richard Foster's Freedom of Simplicity because of the complicated clutter of books I have! I am still going to write about simplicity as a weapon, however, in the hope that I will be challenged to further simplification by what I am about to write. Simplicity as a weapon? Yes, and an important one, too! I continue for the foreseeable future to write this series on our weapons, and although I am hardly an expert on simplicity, I was nudged to include it here because it, like peace, is so key in the exercise of other weapons like kindness, generosity, prayer, joy, etc. How so? Because complexity equals distraction, and distraction always weakens us in battle and is therefore one of our adversary's favorite weapons. (Think about it). He has other ways to distract us, of course, but simplicity of life offers protection against those as well. So take a look with me at a few thoughts about simplifying our lives. First, much of what I write here has its roots in my recent re-reading of "The Simplification of Life" by Thomas Kelly in A Testament of Devotion. You will do well to read this essay if Papa nudges you to respond to this blog in some way. Also, the core of living a simplified life is found in living a life focused on the "One Thing," and I have written considerably about the One Thing life all along, of course. I have even written two blogs entitled "One Thing" that you may find helpful. You can read them in a separate window by clicking here and here. Second, simplicity is not found by adjusting the external but the internal part of our lives. I love what Thomas Kelly says about this: "Let me first suggest that we are giving a false explanation of the complexity of our lives. We blame it upon a complex environment." But, he says, "Complexity of program cannot be blamed upon the complexity of our environment." Rather, he says, "the true explanation of our program is an inner one, not an outer one. The outer distractions of our interests reflect an inner lack of integration of our own lives." But how do we counteract this lack of inner integration? How do we go from the distraction of many voices to following only One voice? Well, of course, I give a hint as to how I wrote that last sentence. We reach simplicity of life by living not a prioritized life (God first, others second, etc. ), but a "centered life" with the One who loves us most at the center of everything else. As we live increasingly attentive to and yielded to Him (the One Thing life), simplicity grows accordingly. This isn't rocket science, of course. If we indeed are attentive to One voice instead of many, if we surrender willingly to His leading, it follows that complexity simply melts away in the light of His clear and single-minded purpose. Writing about the well known Quaker, John Woolman, Kelly says, "He simplified life on the basis of its relation to the divine Center." And "Nothing else really counted so much as attentiveness to that Root of all living which he found within himself." (Wow!). In short, John Woolman (and many others throughout church history and in this present day) discovered that focus on God brings about a wonderful simplicity of life. The more we surrender, listen, obey the voice of the Holy Spirit, the more we live loved, listening, surrendered and saturated (to use my terms), the more simple life becomes. We find ourselves more and more able to say no to the urgent and yes to the important (another great book that relates to all this is Freedom from Tyranny of the Urgent by Charles Hummel). We find ourselves more able to hear the quiet voice in the storm, more able to surrender our anxieties more quickly to the One who can calm them, etc. At this point I need to say two things: First, "No, I don't live this way all the time! Yes, I live there more than I used to. Yes, I lived it out to some extent even in the face of terrible testing, but no, I don't live this way all the time, and I still struggle with distraction at times." But I am a very different fellow from the one who first entered the Secret Place over 8 years ago, and I trust my life will give hope to others who read my story either here or face to face with me! Second, you don't strive or strategize your way into this simplified life, you love your way into it, you surrender and yield your way into it. Thomas Kelly causes our hearts to burn as he writes of "joyful, enthusiastic delight in Him" and "deep, deep-drawing love directed toward Him at every hour of the day and night." And "There is a way of life so hid with Christ in God that in the midst of the day's business one is inwardly lifting brief prayers, short expressions of praise, subdued whispers of adoration..." well, you get the picture, I think. The point is, we love our way into simplicity by experiencing His love for us and responding with a love for Him which moves Him more and more into the center, the true and absolute center, of our lives. Will you consider simplifying your life? I highly recommend it! I close with Thomas Kelly again, his words revealing why simplicity is indeed a powerful weapon: "Life from the Center is a life of unhurried peace and power. It is simple. It is serene. It is amazing. It is radiant. It is triumphant. It takes no time but occupies all of our time. And it makes our life programs new and overcoming. We need not get frantic. He is at the helm. And when our little day is done we lie down quietly in peace, for all is well." Today, I continue the series on how different our weapons as believers are. This looks like it will be a long series! So far, I am thinking that I will need to write about Generosity, Simplicity, Joy, Gratitude, Weakness, Kindness, Gentleness and several more. I think one thing that is important to notice with all of these weapons, the reason they work so well against the enemy of our souls is that they are the opposite of the kingdom of darkness and very much in line with the nature and character of God. For example, there is nothing but fear in the kingdom of darkness, so when we come against the enemy with peace (especially when fear would be the expected response), it not only confused our adversary, it disempowers him by not feeding the things that give him power over us and others. I trust that makes sense--it's a very important factor is discerning what works against our foe and in evaluating what weapon to use (we operate in the opposite spirit). So today, I want to explore briefly the weapon of generosity. But before I do that, I have a few more thoughts about how important the weapon of peace is for us, especially during the current season of heated politics. The following thoughts came to me during my Papa time. I was thinking this morning about how fear never makes a good motivator for the things we really want to accomplish. Yes, fear can motivate--no doubt about that. And yes, sometimes fear is good in that it keeps us from harm. But most of the time, I doubt that it's the right choice, especially in bringing out the purposes of God. Personally, I cannot see how either fear or the anger that flows from it ever really accomplish much. I can, however, see how fear and anger hurt us and others. I am quite convinced that peace is a better approach than fear! And then there's 1 Corinthians 13: “If I vote my conscience, if call my senator, if I advocate for justice for the poor, if I ____ but have not love, it profits me nothing.” And James 1:19-20 “Be slow to anger because the anger of man does not produce the righteousness (justice) of God.” Just thinking…. But now a few words about the remarkably powerful weapon of Generosity. What a remarkable weapon it is, and again so opposite to the kingdom of darkness--there is never a selfless act of giving in that kingdom. Everything, everything is done from self interest! (Thinks about that one for a while!). On the other hand, in God's Kingdom, everything He truly inspires flows from grace-filled generosity! But how is Generosity a weapon? First, let me say that we are talking here about more than giving in the material realm. Generosity is an attitude, a sphere of operation, and it's Generosity of spirit that we are talking about here, and it affects every area of our lives, not just the material. Having established that, how does this amazing weapon work? Some of the ways it works are obvious, of course. When generosity is released against poverty and need, things obviously change. When time is generously given to another, that other's life is changed, etc. But there are ways it works as well. I cannot think of a better weapon against the covetousness of our American culture than Generosity! The more I consider that I am blessed in order to give (see 2 Corinthians 9:8-12), the less vulnerable I am to giving in to the urge to "shop until I drop" or "get that latest gadget" or whatever our covetousness-base culture is urging me to do. I cannot think of a better weapon to use against our culture's "me first" attitude. As I begin to allow God to reshape my thinking towards Generosity rather than gratification, I become a powerful force for His work in others and in the culture itself. Maybe you are catching my drift now, eh? In every area where the enemy has deceived, tempted or attacked, a Generous spirit giving birth to Generosity brings a powerful counterattack! So much more here, but I will stop now, believing that Holy Spirit can help you discover more implications, more uses for the weapon of Generosity. 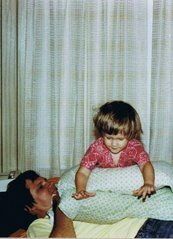 Yes, that's my son, Jon, up in the air (circa 1978)! My journey with God deepened noticeably into what I now call the Secret Place Journey starting in July 2004! It has become a journey into ever-increasing intimacy with Papa God. A hunger for Him, coupled with increasing angst over the contrast between what I read in Scripture and what I saw around me, led me to an encounter that gave birth to a journey into simplicity in every sense of the word, a journey that has led me into many different expressions of the church and including the wonderful expression known as simple/house/organic church. My wanderings, however, as a spiritual daddy are by no means limited to one expression of the Church, as my writings will reveal! The purpose of this blog will be to give outlet to some of the musings that arise as I reflect in God's presence on His Word and on what other trusted sisters and brothers are hearing. I welcome your comments, correction and feedback, and sincerely pray that my journey's reflections will encourage you in your simple life in Jesus! I am a husband, father and grandpa. I am also a spiritual daddy to many, a truly humbling thing to me! I consider myself to be one of the least of Abba's children, yet I am able to say in clear conscience to any who wish to listen: follow Jesus as I follow Him; love as I love; live as I live. To me that's what being a spiritual dad is all about! Like many who have been touched by the organic church world, much of my life and ministry has been and continues to be in the traditional church. I served for a while as professor and Academic Dean of what is now known as Life Pacific College, San Dimas, CA. My most important life markers, however, in my view are related to my family: loving and supporting my wife, Charlie (and before Charlie, Jettie, for 41 years, until she went to be with Jesus in October 2010). By God's grace, my first wife, Jettie, and I raised our two sons to love God with all their hearts, souls and strength. I marvel at Papa's grace to me: He has now added even more family to me (including more grandchildren!) in my marriage to Charlie. From ashes has risen beauty, and I am undone by His kindness.